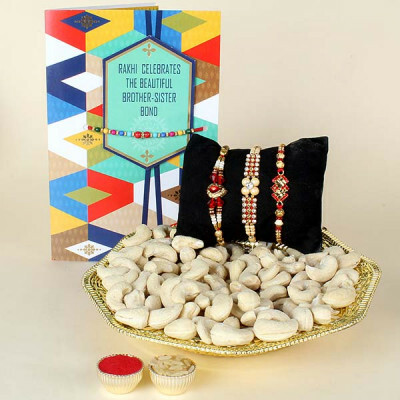 On this Raksha Bandhan, delight your brothers with this perfect rakhi Gift Hamper that has the perfect Sweets and a gorgeous Rakhi. This combo includes a tin of 1kg Haldiram's White Rasagulla and 3 beautiful rakhis. Raksha Bandhan is the vital festival celebrating the personification of the special connection shared between siblings. Gift this charming rakhis to your beloved brothers along with 500gm Kaju Katli and make the occasion more special. For the dearest Brothers who love to share, 1 Kg Gulab Jamun and 1 kg Rasgulla would make a wonderful Gift for Raksha Bandhan. So, on this Raksha Bandhan, surprise your Brothers with these sweets and 3 Rakhis. A wonderful Rakhi not only makes your loving Brother pleased but you too. Their happiness gives you an intellect of pleasure. This Raksha Bandhan, gift him this marvelous gift Hamper that contains 3 attractive Rakhi, 100 gm Cashew, and Greeting Card. Rejoice the sugariness of your relation with your darling brothers by giving them this joyful surprise of appetizing chocolates i.e. Cadbury Celebrations. Pairing them along with Celebrations (wt. 121.3 gms.) Box and 3 Rakhi with Roli Chawal. No one can resist the temptation of devouring a mouth-watering and delicious Ferrero Rocher. It gives a heavenly feeling. Treat your brother with delicious Ferrero Rocher this Raksha Bandhan with this combo that contains 3 Rakhi with 16pc Ferrero Rocher. Secure love and warmth for your brother and astonish him with this dazzling Rakhi combo embellished with Roli and Chawal. Enhance your relationship with your brother with 24pc Ferrero Rocher along with it. The season of Rakhi is the one which leaves its eternal sense on siblings. Send your love, wishes and blessings with this rakhi combo that consists of 3 Rakhi with Roli Chawal and 1 Greeting Card. Rakhi is a festival that results in the pure love between siblings. To make this occasion thrilling and enthusiastic, this exotic rakhi combo is the perfect way to delight your brother. 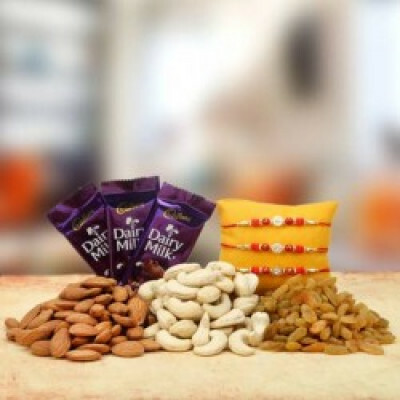 The gift consists of 4 Cadbury Chocolate, 3 types of dry fruits, 3 rakhis, and rolichawal.